2,4 - 5................Don Dayan vom Franckenhorst. 3,5 - 5,5.............Bryan von Forell. 3,5 - 4,5,5,5.......Olive of Bamby's Pride. 4 - 5...................Odin von Forell. 4 - 5...................Rita von Forell. Dutch Club Winner in 1991. Graaf Quirinus van Neêrlands Stam passed the ZTP with 1B rating for character and V for conformation plus winner of numerous show titles. He lived to 11 years of age and tested clear for PHTVL/PHPV. 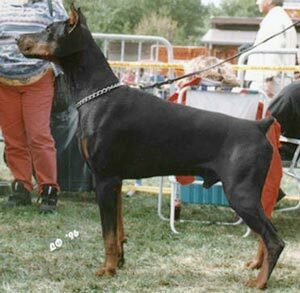 Sarah: SchH 3 and dam of the vom Teufelsblut “N” litter (Normen). Bina: ADPr and passed the ZTP with 1A rating for character and SG for conformation. She is dam of the vom Lechfeld “B, E” litters (Baron, Eischa). Hella Gräfin: SchH3 and dam of the vom Haus Weissenberger “F. H, J, K” litters (Felix, Jonas).